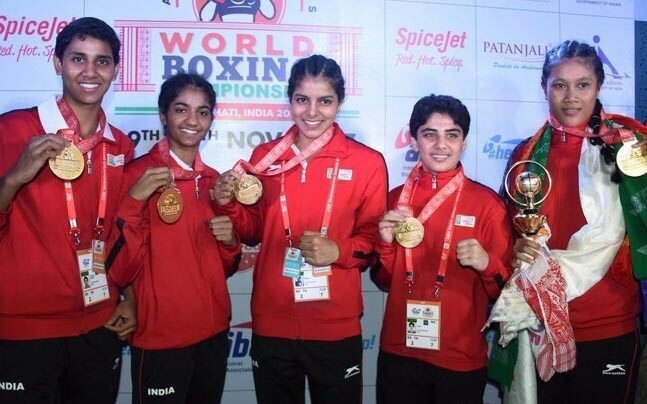 Guwahati, Nov 27: India topped the medals' chart after claiming five gold medals on the final day of the AIBA World Women's Youth Boxing Championships here on Sunday. Nitu, Jyoti, Sakshi, Shashi Chopra and Ankushita Boro clinched the yellow metals. India earlier had also won two bronze medals. It was the biggest medal haul in the championship, followed by Russia (2 gold, 4 silver). The Russian charge was led by the indestructible Anastasiia Shamonova who crushed England's Georgia O'Connor 5-0 in the middleweight category to take gold. Kristina Tkacheva too was in a league of her own, routing Kazakhstan's Dina Isdlambekova 5-0. The only American in the final, Citalli Oritz, scored a 3-2 win over Nataliya Sychugova of Russia in the welterweight final. Lightfly: Nitu (IND) bt Zhazira Urakbayeva (KAZ) 5-0. Flyweight: Jyoti (IND) bt Ekaterina Molchonova (RUS) 5-0. Bantam: Sakshi (IND) bt Ivy-Jane Smith (ENG) 3-2. Feather: Shashi Chopra (IND) bt Nghc Do Hong (VIE) 4-1. Middle: Anastasiia Shamonova (RUS) bt Georgia O'Connor (ENG) 5-0. Light Welter: An kushita Boro (IND) bt Ekaterina Dynnik (RUS) 5-0.